Hundreds of protesting ex-militants have sealed off the Abuja-Lokoja Expressway between the Abaji and Gwagwalada area of Abuja, the Federal Capital of Nigeria. Only last week, the Presidential Adviser on Nigeria Delta, Mr. Timi Alaibe was beaten up in Obubra, Cross River State by ex militants for what they termed the deceit in the Federal Government's Amnesty Program. Three SUV's belonging to Alaibe and his entourage were vandalized during the mayhem. But Alaibe denied the Obubra incident saying it was highly exaggerated by the media. 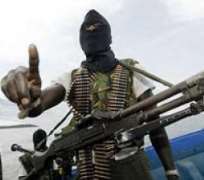 However, sources told Pointblanknews.com that the ex militants are currently protesting for allegedly being shortchanged by Federal Government officials handling the post Amnesty program aimed at resettling the former Militants who have spent years in the creek. Sources put the figure meant for the ex-Militants at N40 Billion.